Odvan is a Breton witchblade who lives in Cidhna Mine. 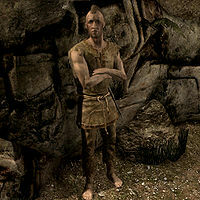 If you ask him about his story he will tell you that "I was sent here because someone said I was a Forsworn." He claims to be innocent by telling you that "I'm innocent. The Nords framed me. I was nowhere near that murder weapon." before telling his whole story: "Guards say I murdered someone. I was just sleeping off some mead in my aunt's house, but that didn't stop them from arresting me. I don't even know who they said I killed." If you ask him about the time he spent in prison he will tell you "A couple of years? I wasn't a Forsworn when I came, but I joined up when I got in. Easier that way." You may sometimes catch him talking about his old life when he remarks "I wonder how grandma Bothela is doing. She's probably worried sick about me." He wears a standard roughspun tunic, like many of his fellow prisoners, and a pair of footwraps. He carries a bottle of skooma and a single shiv. He knows the Alteration spell Oakflesh, the Conjuration spell Raise Zombie, and the Destruction spell Flames. This page was last modified on 17 December 2017, at 21:59.